As a child, Kathy loved swimming, and as soon as she turned 16 and could earn her lifeguard certification, she did. She became a lifeguarding instructor/trainer and a first aid and CPR instructor in the late 1970s. Swimming has remained a focal point of Kathy’s life, and she has managed the city’s swimming pool since the early 1980s and still gives swimming lessons. 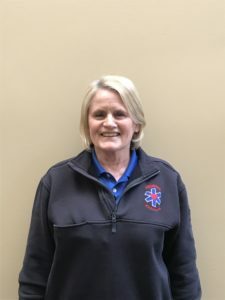 Kathy’s connection with Hillsboro started when she decided to further her medical training and enrolled in an EMT class in 1980—she had barely started the course when she found herself a member of Hillsboro Ambulance Service. She served for 14 years as an EMT, then in 1995 she passed the NREMT-Intermediate exam. Throughout her years of volunteer service, Kathy has held several roles. She’s a certified EMS instructor teaches numerous EMS courses. She served as the squad training officer and as president for over 10 years, and she has assisted on the ND EMS testing team. Kathy even began a program—volunteering her time—to teach all local high school sophomores CPR. She continues to work as an EMT for Hillsboro Ambulance Service today and remains a key figure in the organization. Kathy is known to take a spare AED home many evenings and respond on calls, even while not on duty, when a train is passing through town and delaying an ambulance response. She covers numerous call shifts and is always available as a backup crew member. Kathy has been a strong supporter and leader over the years, and her continued dedication and commitment have helped the service move forward not only in EMS but during changes with the structure and administration of the ambulance service. Kathy owns Uniquely Yours, an antique and craft boutique store in Hillsboro. When the pager goes off and additional help is needed, she closes her store without a second thought and responds. She has cared for countless patients throughout her career, and she has taught and mentored many people who have entered the field of EMS. She is married to Dennis Duval, and they have three grown children, Audra, Jared, and Jenessa. In her spare time she enjoys swimming, painting, going to concerts, and traveling the upper Midwest to visit her children, grandchildren, and family.